John Carroll Grimek (June 17, 1910 – November 20, 1998) was an American bodybuilder and weightlifter active in the 1930s and 1940s. Throughout his career he carried the nicknames "The Monarch of Muscledom" and "The Glow." Grimek was born in Perth Amboy, New Jersey, the son of Slovak immigrants George and Maria Grimek, peasants from the village Ústie nad Oravou in western Slovakia. 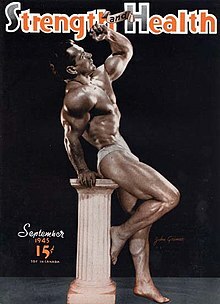 Besides his bodybuilding exploits, Grimek also represented the United States in weightlifting at the 1936 Olympic Games in Berlin. In 1949, he won his last contest, the AAU Mr. USA, against a field that included Steve Reeves, Clarence Ross, George Eiferman, and Armand Tanny. Grimek retired from bodybuilding undefeated. Grimek was featured in many bodybuilding articles and magazines, as well as being photographed in bodybuilding magazines. Despite his retirement, he continued serious training for many years, and was still able to perform squats with over 400 pounds for repetitions in his late 60s. Grimek died on November 20, 1998 in York, Pennsylvania at the age of 88. He was inducted into the IFBB Hall of Fame in 1999. ^ Weider, Joe (December 1998). "John Grimek: 1910–1998" (PDF). Iron Game History. 5 (3). Retrieved February 21, 2012. ^ According to the Social Security Death Index, he was born on June 18, 1911. ^ Whelan, Bob. "John Grimek Was The Man". Natural Strength. Archived from the original on August 8, 2007. Retrieved June 8, 2015. ^ Rosa, Ken (April 1999). "My Thoughts and Reflections on John C. Grimek" (PDF). Iron Game History. 5 (4): 33. Retrieved July 1, 2017. ^ "Prečo John Grimek nenavštívil Slovensko". karabinos.sk (in Slovak). Archived from the original on June 8, 2012. ^ Fair, John (April 1999). "The Weightlifting Exploits of John C. Grimek" (PDF). Iron Game History. pp. 65–66. Retrieved September 5, 2017. ^ "John Grimek". Legendary Fitness. Retrieved June 5, 2015. ^ "John Grimek: The Monarch Of Muscledom". Gym Talk. Retrieved 5 June 2015. ^ "IFBB Hall of Fame Inductees for 1999". IFBB. Interactive Federation of Bodybuilding & Fitness. Archived from the original on February 4, 2012. Retrieved June 8, 2015. John Grimek: "The Monarch Of Muscledom"